Cussing is like a virus. It has spread virtually everywhere: TV, movies, music, books, and daily conversation. Like every bad habit, it's hard to stop. 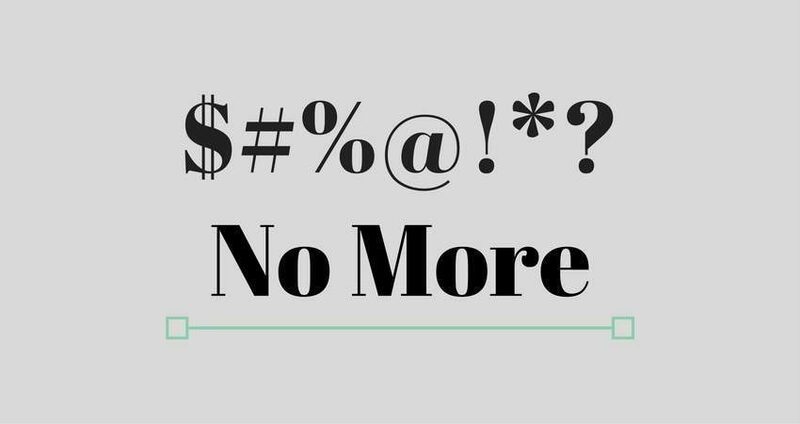 So here are eight compelling reasons to kick the bad habit and STOP cussing. Real men know that vulgarity doesn't breed character and virtue. So they don't cuss. "The General is sorry to be informed that the foolish, and wicked practice of profane cursing and swearing (a vice heretofore little known in an American Army) is growing into fashion; he hopes the officers will, by example, as well as influence, endeavor to check it, and that both they, and the men will reflect, that we can have little hopes of the blessing of Heaven on our Arms, if we insult it by our impiety, and folly; added to this, it is a vice so mean and low, without any temptation, that every man of sense, and character, detests and despises it." Foul language, cussing, and cursing is vulgar, indecent and irreverent. The constant use of foul language drags us down and undermines mutual respect. For example, if a teacher uses foul language in the classroom, he shows an appalling lack of respect for his students, no self-control, and utter irreverence for his position as teacher. But someone might object: "A few foul words won't hurt anyone, right?" Wrong. As author Paul Bourget said: “One must live as one thinks, under pain of sooner or later ending up thinking as one has lived.” In other words, if we use dirty language, we open the door to dirty thoughts and dirty behavior. The art of conversation is one of the most important traits of civilization. Elevated conversation sets true civilization apart from barbarism. When each word is used in its proper context, human relations are cultivated and elevated. There's nothing more uplifting than good conversation. Cussing, however, wreaks havoc on good conversation. It drags human relations into the mud of banality and vulgarity. It's brutalizing and barbaric. The more we hear foul words the more we become desensitized to them. When movies first introduced cuss words, most people didn't like it. But over a period of time, that resistance slowly diminished. Rejection for cussing was worn down and before long the sense of right and wrong was numbed. Whenever we fail to explicitly reject something that is wrong, we implicitly tend to accept it. Consequently, the unacceptable becomes acceptable. And the bar of decency falls lower and lower. For good or for ill the example we give in our speech is noticed and imitated. The words we use cause an impact on our peers. Our example is educational. The words we use educate. We are constantly imitating or being imitated. That interplay of influence holds even more sway over children. Hollywood pop-stars produce a steady stream of verbal garbage that aims to glamorize and normalize foul language. If we want to lift American culture out of the mud, a good place to begin is to stop cussing. With upwards of 200,000 words, the English language is incredibly rich. All sorts of descriptive and interesting words are at our disposal to help us craft ideas full of meaning and purpose. But our vocabulary is degrading. Even in the halls of higher learning, college students frequently use the same cuss word to describe joy, rage, surprise, and approval and disapproval. As a result, speech is rendered meaningless. And the mind -- which is the most noble aspect of man -- is impoverished. Man's unruly passions welcome cussing. When ungodly men are confronted or challenged, they frequently resort to the same response: cussing and vulgar insults. TFP Student Action volunteers see this so often on college campuses. When pro-homosexual activists see our banners that proclaim “God’s Marriage = 1 Man + 1 Woman,” the response is invariably the same: They cuss. Cussing is the language of the movements that promote sin. Sacred Scripture clearly addresses the profanity problem. "But I say unto you, that every idle word that men shall speak, they shall render an account for it in the day of judgment. For by thy words thou shalt be justified, and by thy words thou shalt be condemned" (Matthew 12:36-37). "The mouth of the just shall bring forth wisdom: the tongue of the perverse shall perish. The lips of the just consider what is acceptable: and the mouth of the wicked uttereth perverse things" (Proverbs 10:31-32). "Many have fallen by the edge of the sword, but not so many as have perished by their own tongue" (Ecclus. 28:22). Do you want to help others kick the cussing habit? Then share this post. 1. Do five pushups every time you cuss. 2. Put five dollars in a jar when you cuss. 3. Ask a friend to give up cussing with you.